Clearing trails. In most cases, this involves using hand tools like branch loppers or small tree saws. Those who are comfortable working with power tools are welcome to use them to clear trailsides of brush and trees that have fallen across a trail. The trails are well marked and were GPS surveyed and mapped by forester and volunteer Kate Locke. Creating trailside interpretive signs. If you enjoy teaching others about nature, you can help by creating interpretive trail signs that identify species at interesting locations. These signs can be numbered and linked to a database with more detailed information. If you are savvy with software development, we would love to have a phone app which can provide this information by way of a code scanner. Creating trailside enhancement areas. 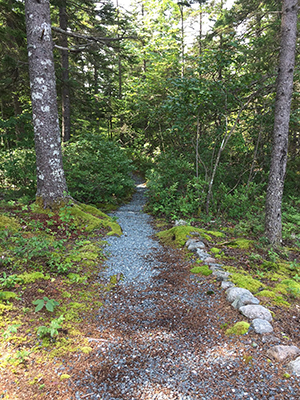 If you have a fondness for tending native plants, there are trails that go, for example, alongside orchid patches and through moss and lichen areas that would benefit from tending by someone with a gentle sense for aesthtices. There are also trail vantage points that can be cared for with the idea of gently clearing a panoramic view of the horizon.